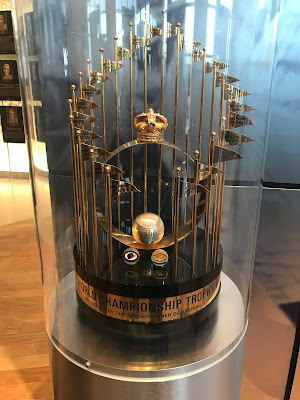 Tribute to the 1969 championship team in the Mets Hall of Fame and Museum. All photos by Jason Schott. 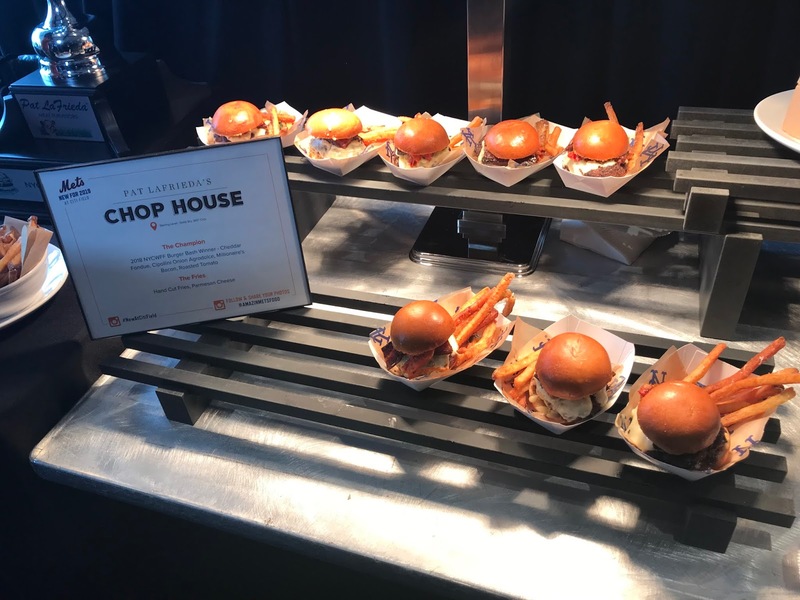 The Mets recently unveiled what fans can expect to see this season at Citi Field. The Mets' Home Opener is on Thursday, April 4 at 1:00 p.m. against the Washington Nationals. 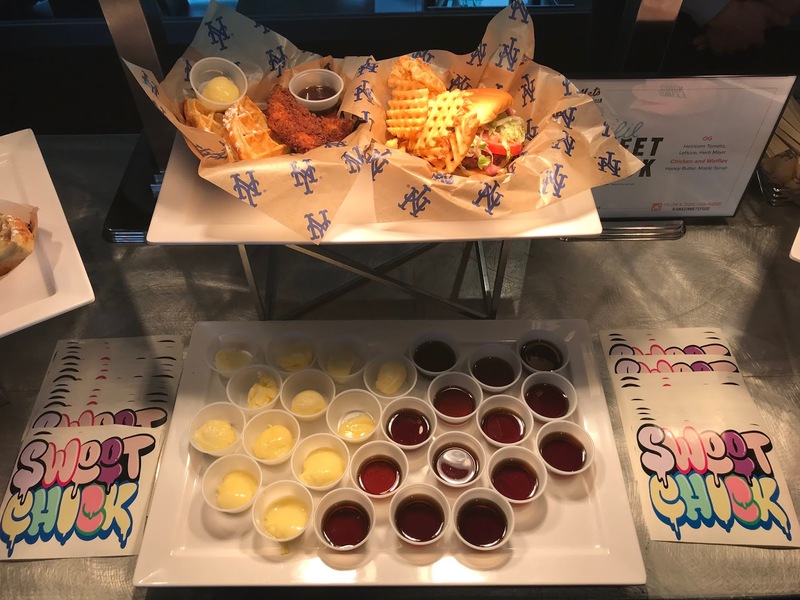 This is the 50th anniversary of the Mets' 1969 World Series Championship Team, and the team is commemorating it throughout the season. 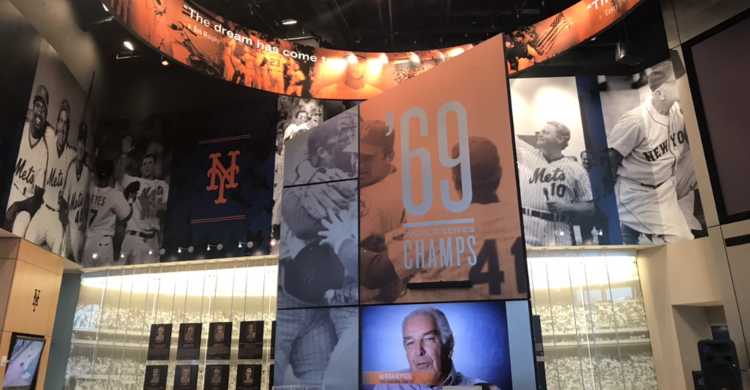 The Mets Hall Of Fame & Museum will have a new 1969 display case (pictured above), which includes artifacts from that season, including Ron Swoboda's game-used glove from "the catch" in Game Four of the World Series, Gil Hodges' manager contract and more. It will be open to fans throughout the season. The Museum is adjacent to the Jackie Robinson Rotunda on the first base side, and is a spectacular attraction for all generations of Mets fans with artifacts from many special moments, interactive kiosks, and highlight videos celebrating the team's biggest feats. 1969 Weekend will take place the weekend of Friday June 28 through Sunday, June 30 when the Mets will be taking on the Atlanta Braves. On Friday night, with first pitch at 7:10 p.m., fans will receive a 1969 Replica Jersey. On Saturday, June 29, before the 4:10 p.m. game, members of the '69 Championship team will reunite for a special pre-game ceremony. The first 15,000 fans in attendance will also receive a 1969 Championship pennant. The celebration closes out on Sunday, June 30 when the first 15,000 fans receive a 1969 Replica Ring. 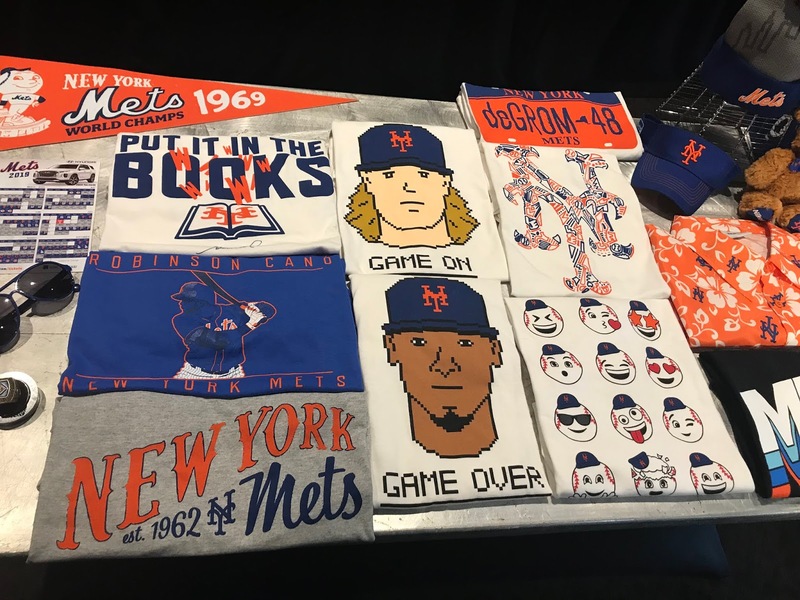 The Mets will be bringing back Free Shirt Fridays, which have been hugely popular. The first one will be on April 26 against the Milwaukee Brewers, and excludes Friday, July 5. 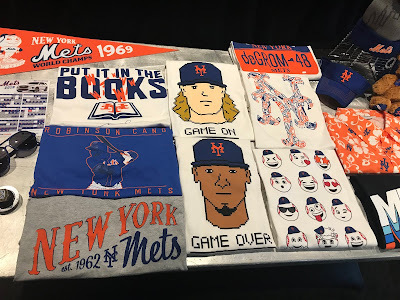 Some of the t-shirts you will get on Friday nights at Citi Field. 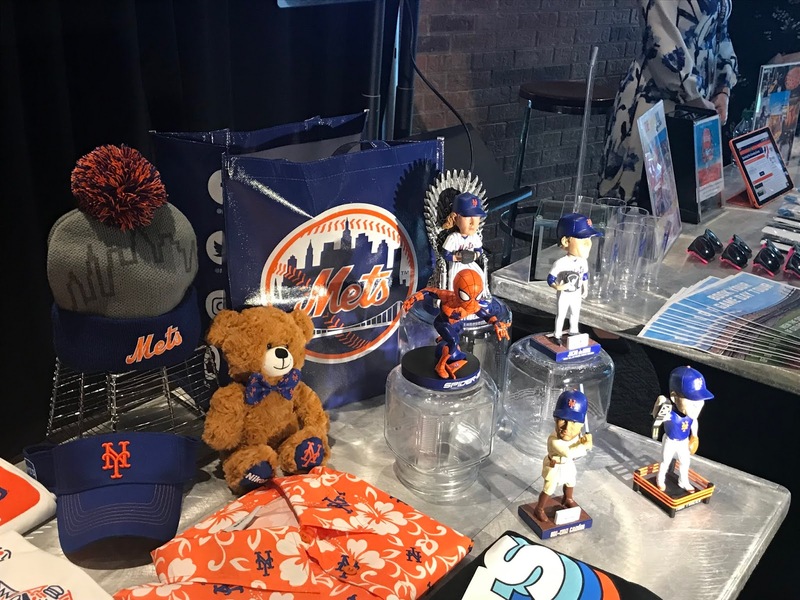 Saturdays are also a special day to go to the ballpark, and the Mets will be highlighting those dates with many unique giveaways. On April 6, when the Mets take on Washington at 1:10 p.m., fans will receive a Todd Frazier WWE Day Bobblehead. On April 27, when the Mets face Milwaukee at 7:10 p.m., fans will receive a Game of Thrones/Noah Syndergaard bobblehead. There will be a Star Wars/Obi-Wan Canobi bobblehead given out on May 25 when the Mets take on the Detroit Tigers at 4:10 p.m. There will be a Spider-Man Bobblehead given out for the Sunday, July 7 game against the Phillies at 1:10 p.m. The first 25,000 fans in attendance will receive these exclusive items. For the full promo schedule, check out mets.com/promos. A look at some of the bobbleheads and other giveaway items. There also are many new additions to the Citi Field dining experience this season, starting with Sliders and Sinkers. They will be offering The Champ Slider, which is served with house spiced bacon, onion agrodolce, roasted tomatoes and a side of Cheddar Cheese dipping sauce, and French Fries made with their own House Made Spice. 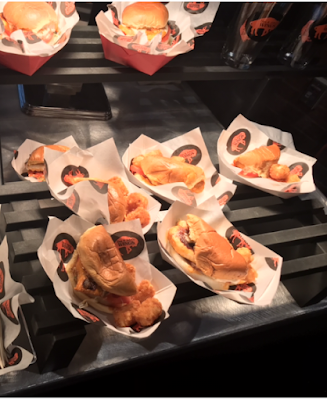 Sliders and Sinkers' delicious offerings. Dulcinea has brought the magic of the Spanish churro to New York City, and now they bring their sweet treats to Citi Field. 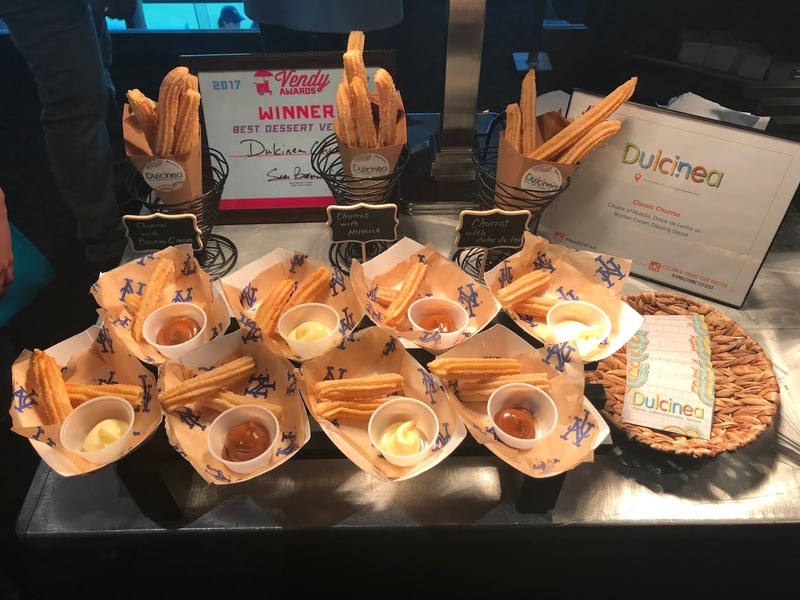 They serve their Classic Churro with a choice of Nutella, Dulce de Leche or Boston Cream Dipping Sauce. Pizza Cupcake combines classic Italian flavors and fresh ingredients to create a delicious shareable snack. 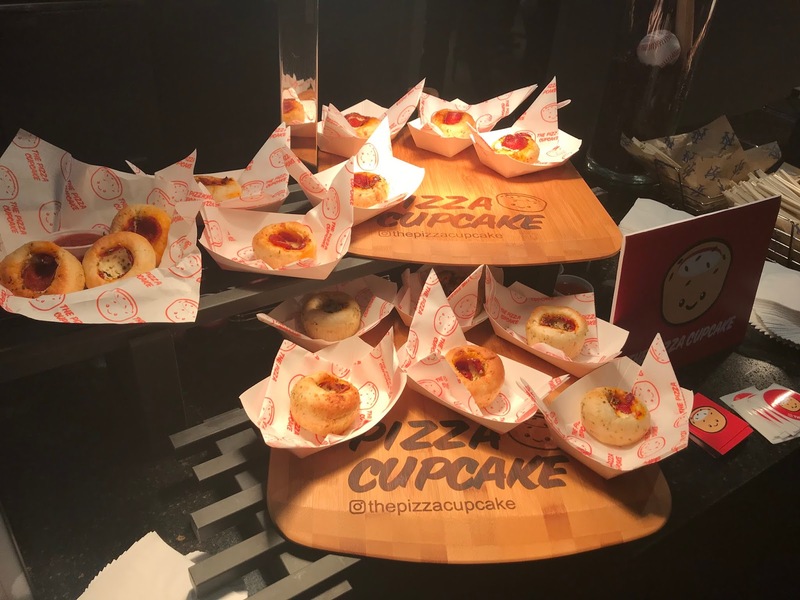 They offer a Margherita Pizza Cupcake, which includes mozzarella and tomatoes, and a Pepperoni Pizza Cupcake, with mozzarella, tomatoes, and pepperoni. Pizza Cupcake, a very unique take on two classics. 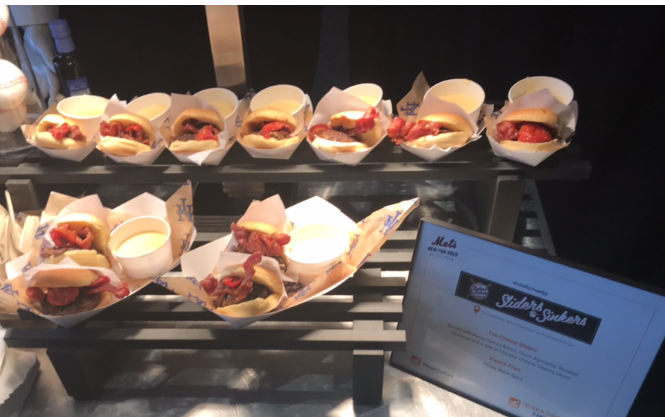 Pat LaFrieda's Chop House is offering The Champion, which was a 2018 NYCWFF Burger Bash Winner, and it features cheddar fondue, cipollini onion agrodolce, Millionaire's bacon, and roasted tomato. It is served with Hand Cut Fries, with parmesan cheese on top. Bash Burger by Chef Josh Capon offers The Bash, which has caramelized onion and bacon jam, shaved pickles, american cheese and secret sauce. Their fries are seasoned with salt and vinegar. 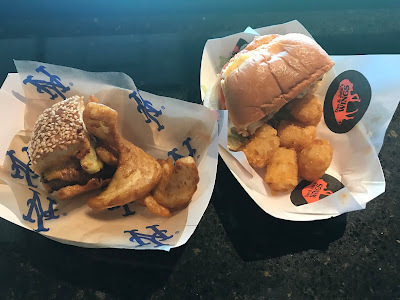 A Bash Burger and a barbecue chicken sandwich from Dan and John's Wings. Dan and John's Wings offers a buffalo chicken sandwich, which includes iceberg lettuce, tomato, white onion, and bleu cheese dressing. It is served with tots. Dan and John's Wings barbecue chicken sandwiches. 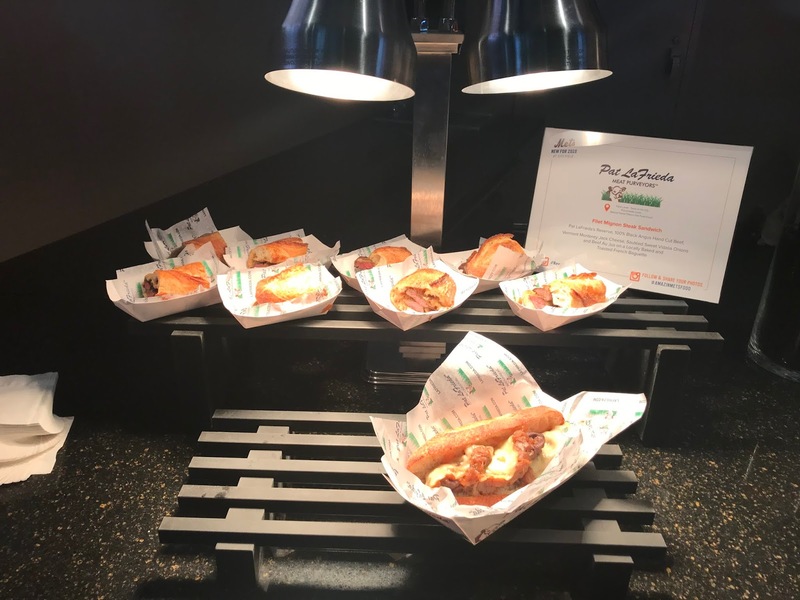 Pat La Frieda will be offering a Filet Mignon Steak Sandwich made with Pat LaFrieda's Reserve, 100% Black Angus Hand Cut Beef, Vermont Monterey jack cheese, sauteed sweet vidalia onions and beef au jus on a locally baked and toasted French baguette. Pat LaFrieda's Filet Mignon Steak Sandwich. 'Lil Sweet Chick will be offering the OG, chicken sandwich made with heirloom tomato, lettuce, and herb mayo; and Chicken and Waffles served with honey butter and maple syrup. Lil' Sweet Chicks savory and sweet offerings. 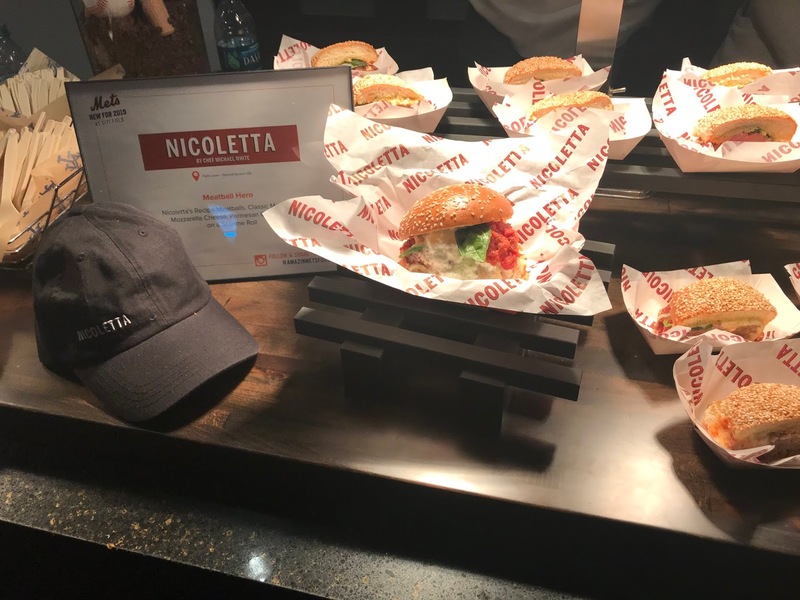 Nicoletta will be offering their delicious Meatball Hero, which includes Nicoletta's Recipe meatballs, classic marinara, mozzarella cheese, and parmesan gremolata on a sesame roll.